“When I grow up, I want to be a stepmom,” said no one. Ever. And so begins “Mother Lode,” the short play I wrote and am directing for this year’s Hembras de Pluma. You might remember from last year that we are a collective of women of color artists, actors, and writers. Or that we debuted during the 2014 Women & Creativity series at the National Hispanic Cultural Center to mostly sold-out audiences. You might remember the one and only Lola, grand dame of 1940s radio who refused to be aged out of her long-running show without a making a statement. You might remember the bond between six sisters and their makeup, or the teenager barricaded behind a flimsy bathroom door with her first box of tampons. Though we know this to be true, I think we were all a bit surprised that we could take the tiniest seedlings of ideas, nurture them with time, attention, and hard work, and share them with our community. But there we were, writing on our laptops and journals around a dining room table, in a living room, on sofas and throw pillows. And then months later, lights, makeup, sound cues, audience. And so we’re back with new stories. This time we’ve gone a little deeper, peeled back another layer. Valli Rivera returns as Lola with new spicy advice for your life and a few secrets to share. Bineshi Albert explores the trafficking of indigenous women through a fast-talking, sharp-dressed salesman. Michelle Estrada Allred shares two stories. In one she journeys to childhood in the land of pecans. 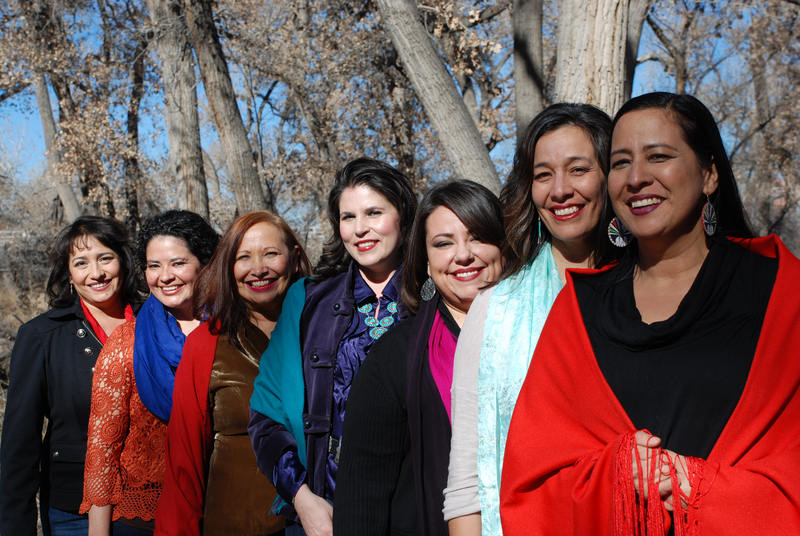 In another she introduces a crew of cholas with a passion for public service. María Teresa Herrera ignites the fire within three women as they drift into memories of life-changing events. Andrea Serrano channels the voice of an elder as his life draws to an end. Please join our audience at the National Hispanic Cultural Center as part of the Siembra Latino Theatre Festival, April 23 – May 3, Thursday – Saturday at 7:30, Sunday at 2:00. For tickets, call 505-724-4771 or visit tinyurl.com/hembras2015. Follow our progress on Facebook and Twitter. Finally, please contribute to our gofundme campaign. By day we work at non-profits, in children’s court, at a cancer center. We defend voting rights, organize our communities to protect clean air and water, and support vulnerable families. We help others tell their stories through poetry, dance, and theatre. Your gift not only enables us to build a set and pay our crew, but it supports our ongoing creative work, telling the stories of our communities, one little seedling at a time.